Whether you love him or hate him, everybody has something to say about Boston Bruins forward Brad Marchand. While some of his on-ice antics may give a bad impression, his play is making it more difficult to deny that the 30-year-old forward is among the NHL’s most elite players. His 87 points put him first in scoring on the Bruins and also marks a new career high with 10 games still remaining this season. With significant injuries to both Patrice Bergeron and David Pastrnak this season, Marchand has been a constant force for the Bruins. With UFC fighter Conor McGregor on hand for Irish Heritage Night between the Bruins and Columbus Blue Jackets, Marchand scored the game-winning goal in overtime and celebrated by mimicking McGregor’s infamous strut. 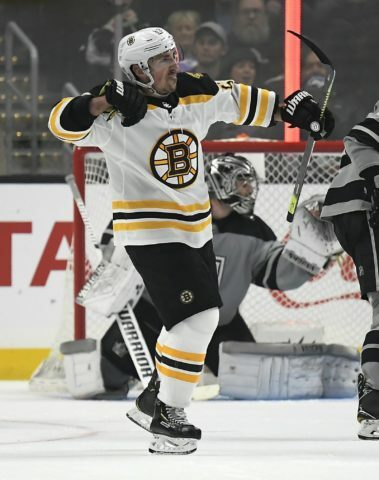 This celebration also represents the biggest factor in Marchand’s success this season: swagger. Marchand’s chemistry with Bergeron on the first line can be seen in all aspects of the game. Whether at even strength, on the power play or even shorthanded, the two seem to be able to get the puck to each other with ease. Since the start of the 2016-17 season, Marchand leads the NHL with 15 shorthanded points, while Bergeron is tied for third in the league with 12. 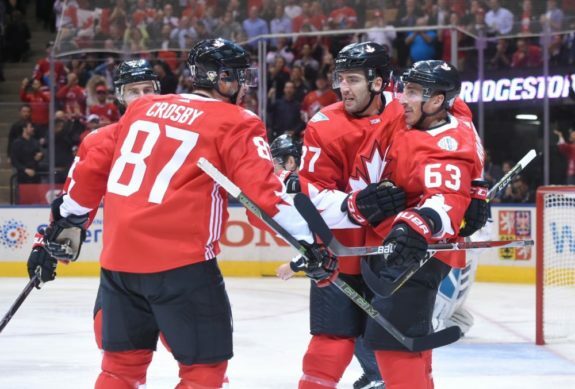 While this connection formed many seasons ago, it reached a whole new level while they were playing alongside Sidney Crosby at the 2016 World Cup of Hockey. Among many of the best hockey players in the world, Marchand finished the tournament as the leading scorer with five goals, including the game-winning goal against Team Europe to secure a gold medal for Canada. Showcasing his talents on one of the biggest possible stages has given Marchand the confidence boost needed to truly become a star. It was during this tournament that Marchand was rewarded with a contract extension from the Bruins. The two sides agreed to a deal worth $49 million that would keep Marchand in Boston through the 2024-25 season, with a cap hit of $6.125 million. Now just a few seasons into that deal and it seems like it was a steal for the Bruins. Since that tournament, Marchand has consistently been an elite scorer in the NHL. Over the past three seasons, he ranks fifth in points with 257, behind only Connor McDavid, Nikita Kucherov, Sidney Crosby and Patrick Kane. Not only has Marchand been the leading scorer for the Bruins, but he has also been the most clutch. With his most recent overtime goal against the Blue Jackets, Marchand is now tied for fifth all-time with 15 career overtime goals. Once a player earns a reputation as an agitator or pest, it is almost impossible to shake it. That is exactly the case for Marchand, as his recent accomplishments are often overshadowed by his past. His last notable move was to lick his opponents, doing so to both Leo Komarov and Ryan Callahan during the 2018 Stanley Cup Playoffs. The biggest difference for Marchand this season compared to previous ones is a focus on his play, rather than his on-ice antics. The winger is no stranger to the Department of Player Safety, having been suspended six times during his career so far, but he has said that he has been working to clean up his game this season. Marchand needed to be a pest in order to carve out a name for himself, but at this point in his career, it is time to leave the gimmicks in the past. Whether it is a conscious effort to clean up his game, or he really is too tired to keep up that behaviour, Marchand’s game has matured this season. As a result, he has recorded the highest point total of his career and has a shot at reaching the 100-point milestone. Marchand has moved his antics from the ice to social media lately. However, rather than going after his opponents, Marchand has been going after his teammate Torey Krug. Both Marchand and Krug are listed at 5-foot-9, and each player insists that the other is actually shorter. Whether this is him trying to shed his past reputation or simply having fun remains to be seen. Whatever the case may be, Marchand has seemingly cleaned up his act and is among the NHL’s best scorers as a result.